Telecommunications student Odum Rowani is conducting a leading-edge study of how weather affects mobile networks in partnership with top engineers from NEC, BT and EE. Odum, who graduated in MSc Data Telecommunications Networks, is researching for his PhD on the effects of variations in global weather conditions on the quality of data transmission for mobile networks. And he has the perfect test-bed for his work at the University of Salford after telecom giants NEC, BT and EE chose Salford as a research partner to test new 4G evolution and 5G related network technology. Much testing is still needed on the optimum deployment and robustness of ‘point-to-point’ transmissions which use radio millimetre wave frequencies in the 60GHz band; particular how they may stand up to the rigours of the British weather. 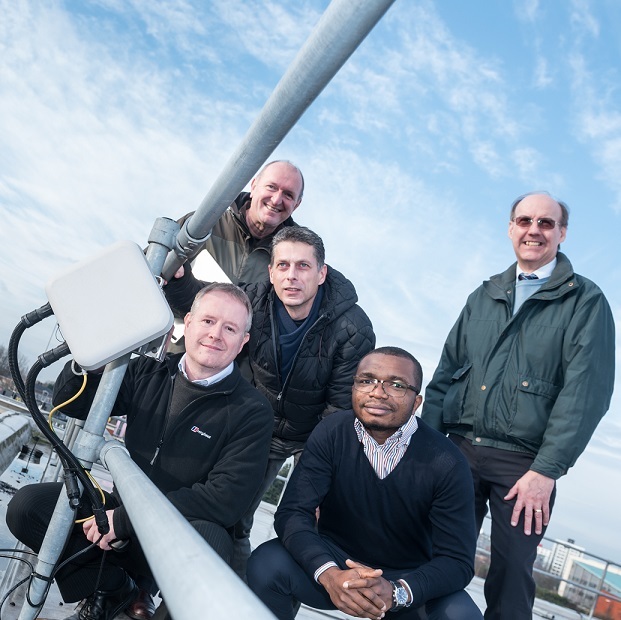 Using the University of Salford as a base, the NEC, BT and EE have created a research site to measure the performance of the V-band radio system over a 12-month period when exposed to rain, wind, fog and ice. “This will be one of the most detailed tests of this type done anywhere in the world to date, so we are delighted it will be hosted in Salford with our partners NEC, EE and British Telecom,” explained Professor Nigel Linge, one of Odum’s professors. The University has installed a radio system complete with transceivers and antennas on the Newton Science and Engineering building and the Maxwell Building at its Peel Park Campus and will monitor transmissions until early 2018.